We were so close. I reached out my hand to touch him and decided not to. He poked his little beady eyes above the surface. Glanced around and finding nothing remotely interesting ducked back under the water, swam straight to the bottom and continued to munch on the swaying sea grass. I’ve seen turtles. I’ve seen them in zoos. I’ve seen them in sanctuaries. But I have never seen a turtle in the wild. Mexico has the largest number of sea turtle species worldwide and when the Barefoot Nomads asked if we wanted to come to Akumal with them, we were beyond excited. It was on the list – the one I had made using a load of information from their blog. Not only could I cross it off the Playa list, but now we could also meet the wonderful family that had helped us with our time in Playa. We meet at a playground in town. A harsh site with gravel for flooring, no rails on the high ship plank and zero shade. A kids dream, a parent’s nightmare. Micki & Chuck, a travelling family like us, were a delight and we fell straight into talking while the kids played on the equipment. Finally the beating sun got the better of us and we crossed the road to jump on a collectivo. 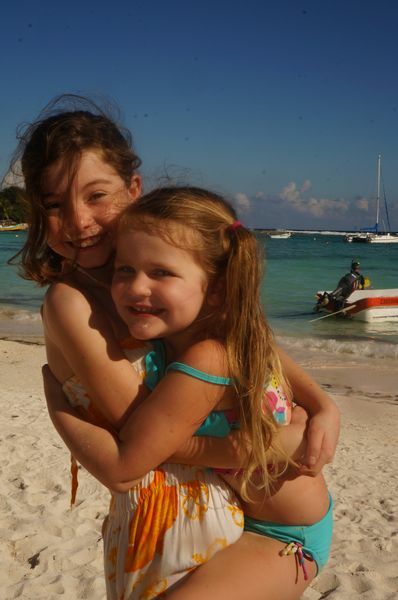 Once the bus was full, funnily enough with plenty of other Australians, we were off on a quick journey to Akumal. 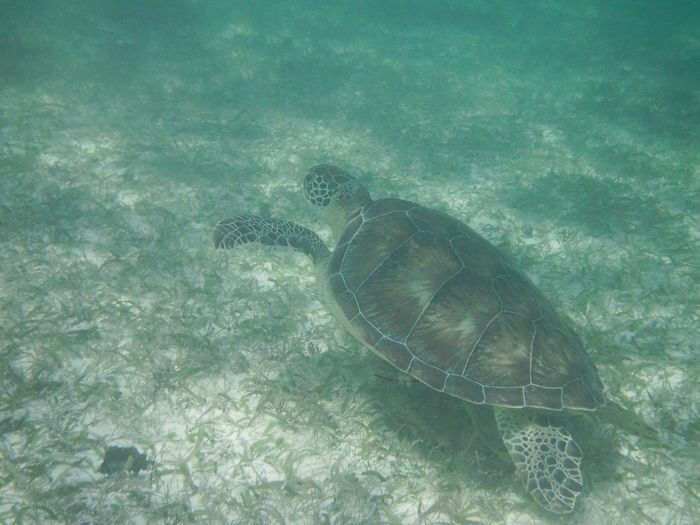 Did you know Akumal means “place of the turtle” in the Mayan language? The signage is pretty good on the Mexican freeways and it’s also recognizable by the overpass. Once we jumped off and paid our $35 pesos for each seat (we used two) we crossed over the bridge and started a 15-minute walk to the beach. Pretty straight forward straight up one road. We passed a supermarket and grabbed a cold drink before stepping foot onto one of the most beautiful beaches I had ever seen. Restaurants lined the shore and there was but a small walk from restaurant to water. This sand was filled with palm trees creating premium shade. It’s the best of both worlds for fair freckle faces when they can lie on a tropical beach under the shade of a palm tree. The children got straight into the buckets and spades while we set up camp under a palm tree. The men decided to hit the water in search of turtles while Micki and I got chatting. Soon another travelling family joined us. They don’t have a blog and have requested their ultra cool acronym to be used SP5.5 – 0.5 for the baby that is living in Mrs. SP’s belly. Once the men got back it was the ladies turn for a swim. Micki and I barely swam far at all before she was pointing out beautiful wild sea turtles. Two young ones on the sandy floor eating the gently swaying sea grass. They looked just like Crush from Finding Nemo. One of them even made his way to the surface for a little air. He glanced briefly around with his beady dark eyes and clearly finding no human of any interest swam his way back to the ocean floor. These turtles are known as the Green Sea Turtle (Chelonia Mydas) and are on the endangered species list. The turtles swam on so we went in search for bigger ones and spotted one near a group of snorkelers. It’s the quickest and easiest way to spot a turtle (look for the huddle of humans). 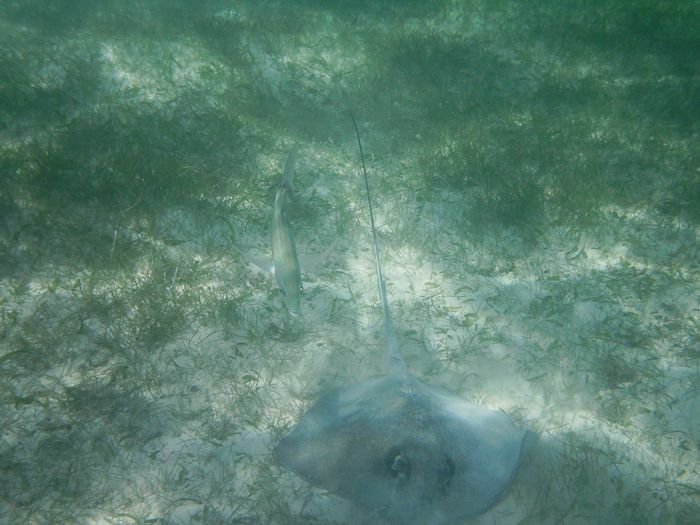 During our swim we also saw a few different coloured fish and even a stingray or manatee or manaray… I am not sure what it was, but I couldn’t stop the brief news headline of Steve Erwin dying from a Stingray before I decided a quick glance was a good enough look. Back at the shore everyone was hungry. We stopped at one of the many seaside restaurants for a Mexican bite and then before I knew it, it was late afternoon. SP5.5 had their own mode of transport and we made plans to see them again before the Barefoot Nomads and us made our way on foot towards the collective. There were several along the beach street waiting for people so it was a much shorter walk. This is an incredible FREE experience. The turtles have no interest in anyone swimming around them and I found most of the swimmers to be completely respectful of them. The beach was absolutely gorgeous. The water clear as glass. I highly recommend a swim at Akumal to see the turtles; I can’t wait to go back and maybe next time I will be able to pry the kids from their sand castles to come meet 'Crush', the Green Sea Turtle. You made me jump in the year 2000...i worked there for the whole year...one of my greatest experience! You're making me wish I was back there again! Glad you're having a great time! The reef heading south is the second largest barrier reef after OZ! What a great experience, especially for the kids! 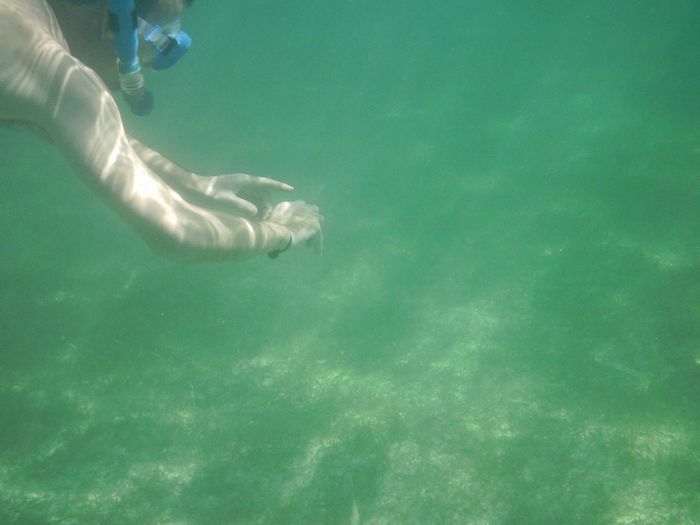 I had the opportunity to snorkel with turtles in Hawaii; the experience changed my life! 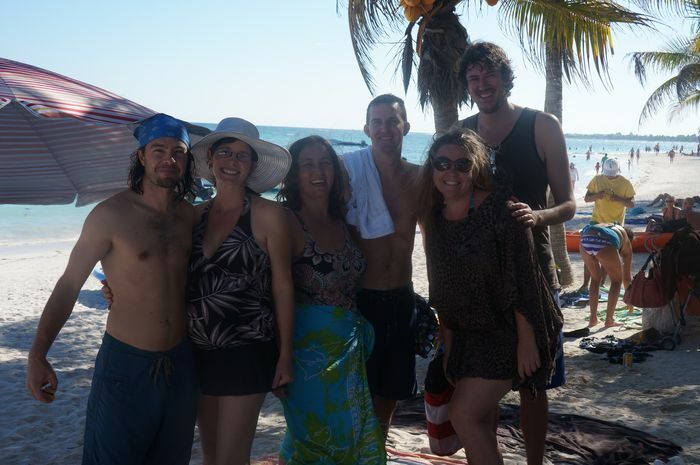 Ever since then I've been down in Puerto Rico, the Florida Keys & (now) next Spring in Mexico! I'm planning on going there this april, mind i ask where did you stay in mexico? and how far was akumal beach from where you were?